I have a new article in today's edition of The Japan Times, available online here, or in the print edition. It's about shinmai (新米）or new harvest rice, one of the must-have foods in Japan in the fall. There's also a recipe for the plainest kind of onigiri (rice balls) of them all, shio musubi, plain rice balls with just salt on the outside. With really good rice, especially new harvest rice, you don't need much else! Incidentally, I think that people in Hawaii can get a hold of new harvest rice, but I don't know if it's sold anywhere else outside of Japan. If it is, let me know! Submitted by maki on 2010-10-29 11:03. A Japanese friend says there's ONE shop here in Toronto where she can buy it, and it's very expensive. But I might have to try it, just to see. [quote=Dan Powell]A Japanese friend says there's ONE shop here in Toronto where she can buy it, and it's very expensive. But I might have to try it, just to see. I am in TO - which shop sells it? I suspect it's Sanko on Queen st., but please let me know if it's something else. I'm in Los Angeles, and I've seen bags of rice with a "new crop" sticker on them at the Korean/Japanese market downtown. That would be Woori Market. They also have it in the handful of Nijiya and Marukai markets scattered around the state. I also managed to get matsutake mushrooms from the one in Little Tokyo! You can buy it at pretty much every Japanese grocery store in California, and some of the Korean and Chinese stores, too. I just finished reading _The Story of Sushi_, a pretty interesting kind of journalistic book. I have no idea what you'd think of it, though. The writer notes that he was told that shinmai isn't good for (fish-topped) nigiri sushi because of its particular properties (I forget the specifics), with the implication that some people would try to make it anyway just because they know it's special rice. It was implied that you should just enjoy it simply prepared, in a rice ball, etc., like in your article. Thanks for the link, love Japanese rice! does it have to have a Shinmai label? anyone happen to know where i can find this type in san francisco? I read your Japan Times article and notice you advise washing the rice. I heard (somewhere) that the original instruction to wash the rice was because it was coated with asbestos(!!!) to make it look whiter. Have you heard this before? And if that was the reason before, what is the reason now? And Dan, who knows of one shop in Toronto that sells Shinmai, I too would like to know if that shop is Sanko. I've never heard the asbestos one before, at least in Japan, except in some cases where they found traces of asbestos in rice that had been grown near or over a former U.S. military base's waste disposal or something like that. The reason for rinsing rice is to get rid of the powdery coating that is left after the rice is hulled. It results in a cleaner tasting rice. Now, if you are making risotto, you use that powdery coating to create the creamy texture that is characteristic of risotto, so you don't rinse the rice. You may find my basic Japanese rice how-to useful. I bought a small bag of "new crop" rice last year from our Japanese store. Don't know if that is the same thing. Unfortunately, when I opened up the bag it was completely filled with bugs and other nastiness so I never got to try it. Hate it when that happens. Here in Seattle, there's bags marked as "new crop" but since they're stickers, I always wonder if that was "last year's new crop". I mean, do they have to remove or hide the stickers at some point? Sorry for the misinformation about asbestos. I mentioned it to a friend and she said it wasn't asbestos, it was talc. I have seen shinmai sold at Nijiya in the SF bay area. I am sure other stores carry it, too. I haven't been yet, but in the most recent flyer, Mitsuwa over in NJ has been advertising shinmai. As with most specialty rices, it's pricey, and I'm not sure my taste buds are really refined enough to taste the difference. I grew up in a rice production area in Italy, and I remember that at some point in winter, the new harvest's rice would appear. The fresher the rice, the better and more fragrant it tastes, but in Italy this did not develop in any special name or recognition for it. I wonder if this is similar to shinmai at all? I would be very curious to try. I live on the East side of the San Francisco Bay Area. I was at a Ranch 99 Market in my area today, and they had new crop rice today - both white and brown rice. I've seen new crop white rice there in the past, but this was the first time I'd noticed new crop brown rice. Shinmai from Japan is sold online in HK. The company imports the harvested unhulled rice from Japan, then hulls it to order at their workshop in HK. It's something I would love to try next time I'm there to visit. Not cheap, but factoring in delivery costs, it's about the same as buying pre-packed rice imported from Japan at the high end supermarket chains. It's a little difficult to find a right and reasonable bland rice here. I always cook rice without using a ricecooker. Oh? I live in Flushing, Queens; and it's actually very easy to find well priced rice in my area. Interesting, what makes Nishiki bad? I'm curious since we always have used their brand. I've bought "new crop" rice in Atlanta, at Tomato Store. This was a few years back, but I believe it was around $40 for a bag - I can't recall whether it was 7.5k or maybe 10k? But I'm pretty certain it wasn't just 5 kilos, so the price wasn't as outrageous as I felt it was at the time (my mom bought it for me, insisting it was the best, and I must admit it was good). I have no idea if anyone still reads comments for "old" posts, but this seemed like the right place to ask. I've been wondering how much (uncooked) rice one usually calculates per person. I know that this may vary depending on the person but is there a general amount? According to Google a number of people have suggested 1/4 cup of uncooked rice, which equals to roughly 60ml, is sufficient. Considering that this amount does not even fill a standard sized rice bowl, I was wondering what you guys think? In case it matters, I am asking for dinner portion sizes, not lunch. I think it depends on the type of cuisine. In Japanese and other Asian cuisines, you tend to have more rice per person, sinc that is often the center of the meal. So in Japan you usually have about 1/3rd of a U.S. cup of uncooked rice per person, which yields a rice bowl full of cooked rice. (The calorie count given for a standard bowl of rice in Japan is 160 calories, so you can back-calculate from that if you're good at math.) Of course, quite a lot of people have 2 bowls of rice at a meal, and others have maybe 1/2 a bowl. In other (western) cuisines the amount of rice on a plate is often way less, unless it's the main component of a meal as with paella or risotto, but then you're eating bread before the meal and/or dessert afterwards and things like that. Ah, that makes sense to me. I guess I can keep enjoying my rice then. The The limitation of the machines that required using a hole for filling the onigiri instead of rolling the filling with the rice actually made new flavors of onigiri easier to produce as this cooking process did not require changes from ingredient to ingredient. 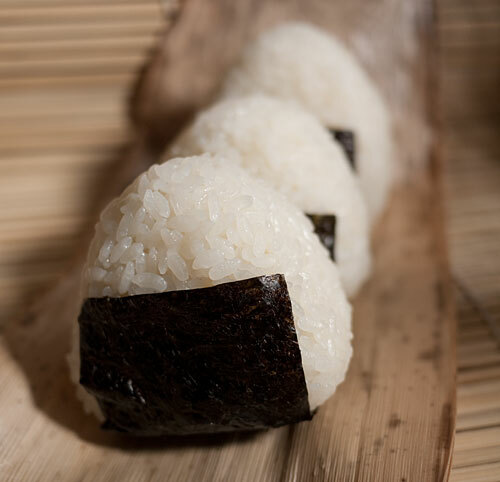 Modern mechanically wrapped onigiri are specially folded so that the plastic wrapping is actually folded between the nori and rice to act as a moisture barrier. Thanks.